Andrew Castrucci is laying out artworks and artifacts at the Bullet Space. Bullet Space is an art gallery in a squat. The place recently exhibited decades' worth of work by the tin can cutting recycling artist Rolando Polliti. His constructions ornament the fence of the Plaza Cultural garden on 9th Street and Avenue C, original site of the CHARAS agitations of the 1970s. 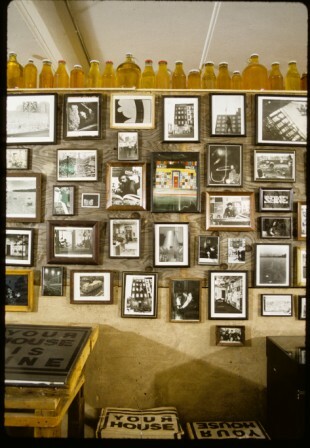 This assemblage of artworks collected by Andrew over the years reveals something about this period of Lower East Side history, and the people who squatted these buildings. The context of the early works of the ‘80s and ‘90s is the squatter struggle.